Add a touch of gold to your mid-autumn festivities with our Yuan Yang Snowskin Mooncake filled with rich caramel! This locally-inspired Yuan Yang Caramel Snowskin Mooncake recipe is shared by home cook Cheng Geck Chau. Treat yourself and your family to this luxurious creation! This Yuan Yang Caramel Snowskin Mooncake is sure to win hearts all around! 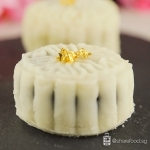 Celebrate the mid-autumn festival with your own homemade Yuan Yang Caramel Snowskin Mooncake! 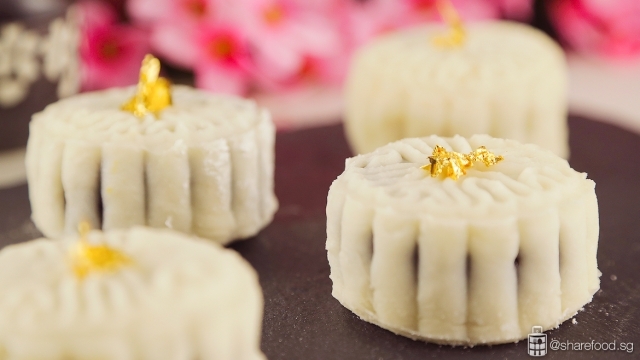 Wrapped in delicate snowskin and filled with rich and fragrant yuan yang (Yuan Yang refers to a drink made of a mixture of coffee and tea) paste, luscious caramel and topped off with edible gold leaf. 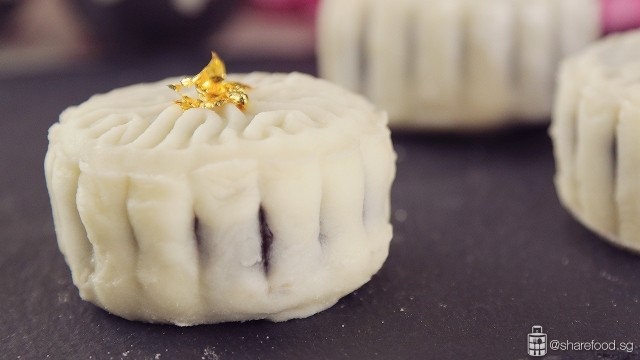 If you think mooncakes are hard to make, this recipe would change that mindset. For this recipe, we'll start by making the delicate snowskin. 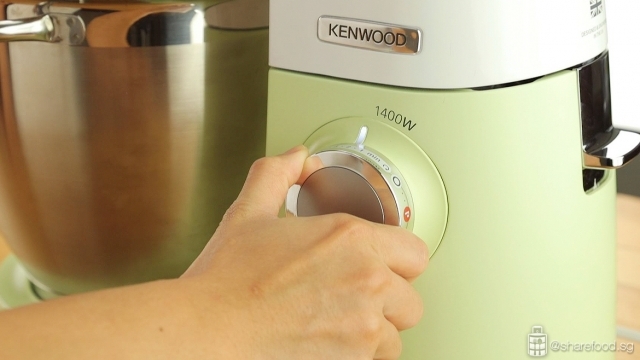 Simply place all ingredients into the Kenwood Chef XL Sense stand mixer. 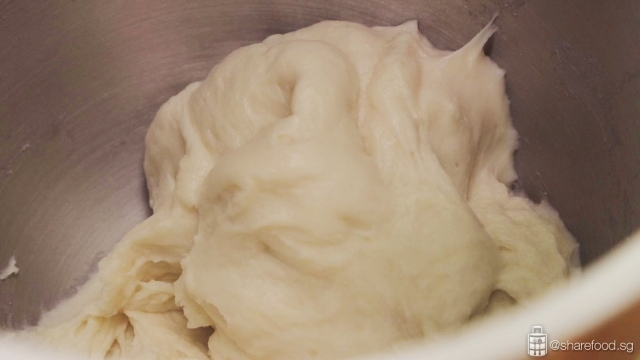 Attach the K beater attachment, and beat ingredients are well mixed and form into a smooth and springy dough. Clingwrap the dough and place in the chiller for 1 hr. Next step, we will be preparing the luscious coffee caramel sauce. In a bowl add in coffee powder and water. Stir constantly till the coffee powder dissolves and add in the whipping cream as well as the butter. Set the coffee mixture aside. In a saucepan, pour in water and sugar. Heat over low fire and when the sugar dissolves, increase the heat to medium. When the mixture turns to amber, switch off the stove and allow it to cool. Add in the coffee mixture, pour in salt and give it a final stir. 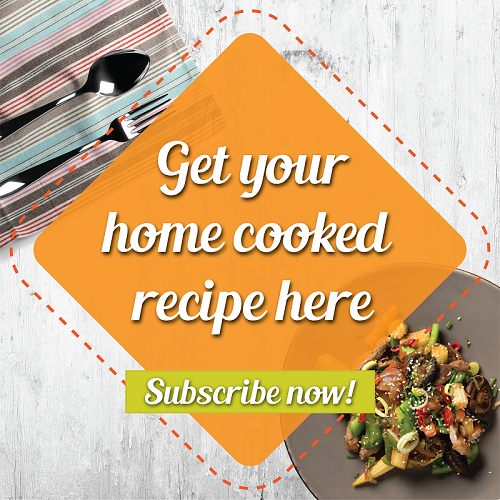 Pour the sauce into a bowl and allow it to cool. Transfer it to a chiller to thicken. 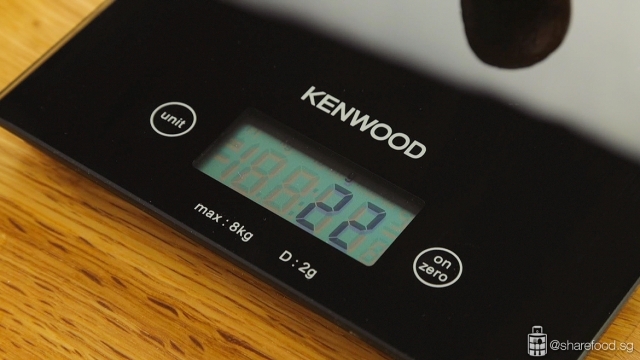 Use a weighing scale to ensure the mooncakes are of perfect shape and size. To ensure that the Yuan Yang Caramel Snowskin Mooncakes is of the perfect shape and size, we used a weighing scale for precise measurements. Divide the tea paste into 8 pcs of 22g and 8 pcs of 3g. Roll it into a ball. Take 1pc of the 22g ball and poke a hole in the middle. This creates a well to squeeze in the caramel sauce. Flatten the 3g ball and patch up the hole. Repeat steps for all. 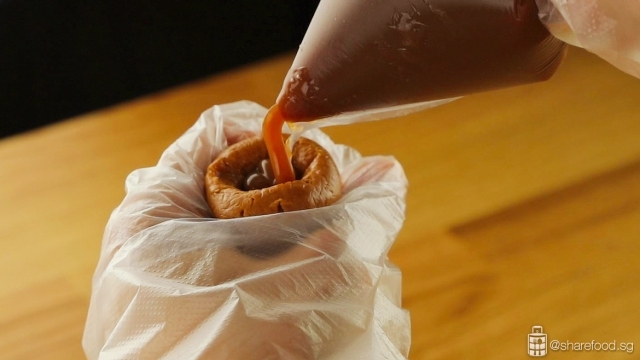 Poke a hole in the middle of the tea paste ball to create a well and fill it with the luscious caramel sauce. Followed by dividing the coffee paste into 36g each and wrap the tea filling. Place them on a tray and transfer into a chiller for 30mins. Divide the snowskin into 38g and wrap the filling. Dust the Yuan Yang Caramel Snowskin Mooncake with some premixed flour and place into the mould. Gently press it out and garnish with edible gold leaf. Add a touch of gold to your mid-autumn festivities with our Yuan Yang Snowskin Mooncake filled with rich caramel! Treat yourself and your family to this luxurious creation! 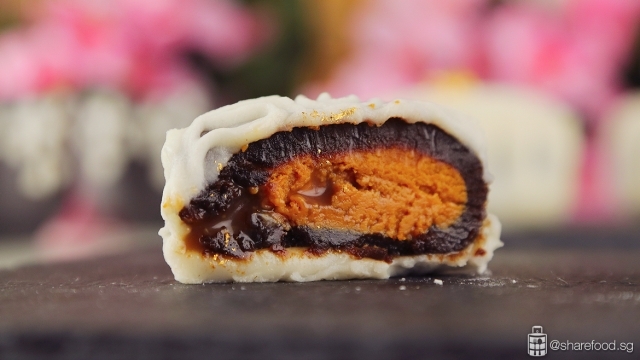 This Yuan Yang Caramel Snowskin Mooncake is sure to win hearts all around! Take a bite and enjoy the combination of yuan yang paste with a rich caramel that makes it so hard to resist! Enjoy a slice of this mooncake with a cup of nicely brewed tea and have a happy mid-autumn festival! Add a touch of gold to your mid-autumn festivities with our Yuan Yang Snowskin Mooncake filled with rich caramel! 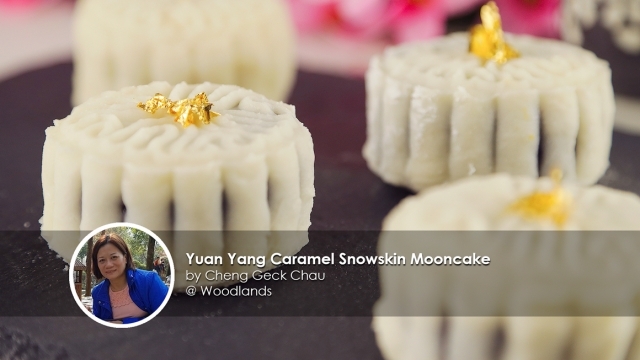 This locally-inspired Yuan Yang Caramel Snowskin Mooncake recipe is shared by home cook Cheng Geck Chau.